Come rain or shine, summer or winter, ensure that your locks always look as though they have been kissed by the sun with the L'Oreal Casting Sunkiss Jelly Gradual Lightening 02. This Gradual Lightening Jelly is in 02, which is for dark to light blondes. Apply the jelly to the strands of your hair to lighten and bring out your natural highlights. You will see results instantly, but can reapply to go even lighter. This product is for natural hair only, and is not suitable for those with dyed or bleached hair. 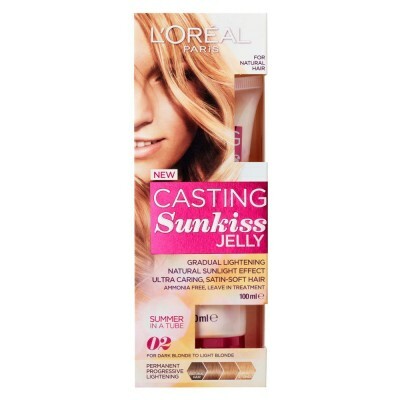 L'Oreal Casting Sunkiss Jelly Gradual Lightening contains 100 ml.